If you never had the pleasure of seeing Broadcast on tour, particularly in their early years with keyboardist Roj Stevens and guitarist Tim Felton, then this is for you. Actually, this is for everyone. It’s a dark and saddening time for fans of the band since the recent and sudden passing of singer/multi-instrumentalist Trish Keenan. But I can’t think of a better way to celebrate her life than to spread the group’s music around to as many people as possible. 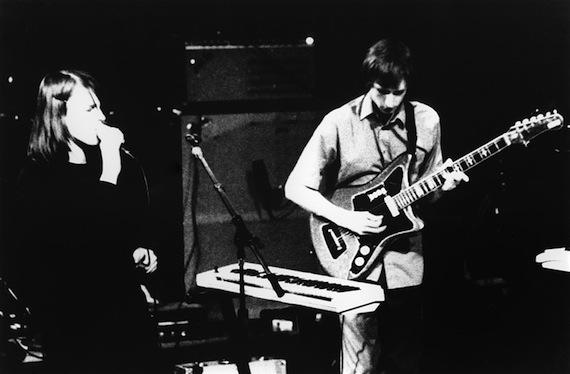 Broadcast’s Black Session from Paris, France — May 4th, 2000 is a perfect representation of their trademark electronic art-pop, Trish’s amazing voice and the band’s ability to transform experimental recordings into beautiful live performances. Best band o’ the last 15 years. Your original post of this session is what introduced me to Broadcast, so thank you very much indeed. I’m particularly fond of the extended ‘Unchanging Window’ here. Terrific band! The guitarist sure looks a lot like Pete Townshend in that photo. Trish Keenan was such a loss and good on Broadcast for going on. Loved the idea of ‘hauntology’ – what the future music would be or will be?? The song ‘Book Lovers’ was really memorable – yeah, I know that is going back a bit -1997! I’ve always kind of liked Broadcast, but this live set is a different beast altogether. Really great stuff. what is the brief snippet of song between Come On, Let’s Go and Interlude 2? I can’t find it anywhere and I love it! Absolutely brilliant. Thank you !!!! Any chance that the ZIP file of this session could be made available again? I missed it the first time around. Link is dead. I would die for a re-up of this. Been searching for the past 4-5 hours with no luck, keep getting directed to the same AD link which is dead. Further reading lead me to find that they do not even want you to email them requesting re-uploads or direct links or anything. AD please get this file back up more people need to grab it!!!!! PLEASE re-up this! thank you.